Merlin is a beautiful designed Magazine WordPress theme with a responsive layout. The theme comes with a gorhttps://awplife.com/top-10-beautiful-wordpress-themes-october-2015/geous Post Slider, Magazine Homepage template and a Header Widget area. The New Maxx – a free WordPress blog theme designed for the online publisher with support for images, galleries, audio and video. This theme can be used to setup a fashion website, a studio, Photography, Artistic Showcase, or similar website that needs to show yours product on beautiful landing pages. Himalayas is modern style free one page, parallax and responsive WordPress theme. Inform your visitors all they need to know right from your home page without requiring to go to the other pages. Himalayas can be used for business, portfolio, corporate, agency, photography, freelancers and almost any kind of sites. SKT Hotel is a hotel WordPress theme which is responsive. It caters to hotel, hospitality business, restaurant, eatery, cuisine, recipe, cafe, lodge, food joint and others. It is mobile friendly and has a very nice animated homepage. SKT Hotel Theme can be easily set up using Customizer API. Aron is the best free responsive wordpress theme for Multi-Purpose. Anyone can install this theme into their website. Its very sleek and comes with fully customization options. It has a very simple admin section. Allegiant is a multipurpose WordPress theme suited for creating just about any kind of website. It comes with a vast array of features that will let you create many different kinds of content– from portfolios to services and team members. This theme is especially great for designing event-oriented websites and agency pages. You can take advantage of the team member functionality to showcase people of your organization. You can also add a testimonials section for social proof. Allegiant is completely responsive, and can adapt screen size of any device. Your content will be handled gracefully and will shine on every way possible. 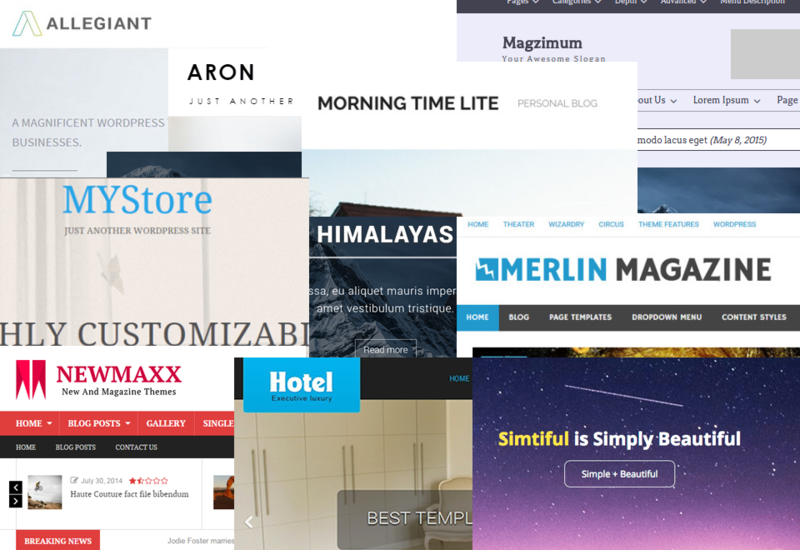 Magzimum is a simple, clean and responsive WordPress theme designed to suit the need of Magazine, Blog and News sites. It has built-in WordPress customizer. It’s now easier than ever to make your website according to your needs. You can easily add a custom logo, favicon, web clip icon, social icons, background, custom menu, slider, featured content, breaking news, pagination, bradcrumb and more. With MYStore, which is fully responsive and packed in a big bunch of settings. It will let you customize almost everything from the header colors, layouts to the body content & design. You can select between 5 different footer layouts in premium. MYStore is also integrated with WooCommerce so you can easily build an online store and select between 2 different WooCommerce layouts. It is integrated with SiteOrigin’s Page Builder plugin which allows you to easily build beautiful page layouts that you want. It has styling option for Contact Form 7 to make beautiful contact pages. MYStore Theme also comes with a simple beautiful default slider as well as the options to add other sliders. You can select your own fonts and colors, social links etc. You can also make blog and Shop page with full width with a variety of page templates… MYStore has it all… Enjoy. Morning Time Lite is a modern and clean Premium WordPress theme designed for personal Blogging. The theme will help you to get a unique look for your blog as it has a lot of great features. Morning Time Lite is perfect to display daily articles in a beautiful way. The design is responsive, so the theme could look just perfect for devices such as iPad, iPhone, and desktop. It has a great post format gallery which creates the possibility for you to display images from your galleries inside posts. Morning Time Lite also comes with awesome standard post format, audio post format, quote, aside and video post format. Simtiful is a simeple and full responsive WordPress theme designed for Simplicity, Usability & Legibility. Hope you find some beautiful theme for your blog, client or business.